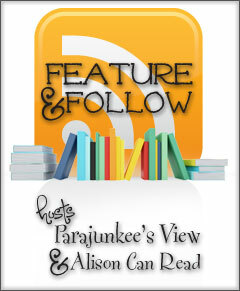 Follow Friday is hosted by Alison Can Read and Parajunkee. For me, it's to improve my writing. I started my first blog to have somewhere to write every day, because I heard writing every day would improve my writing. I realized quickly I had nothing to say and started reviewing books. I learned so much doing reviews! I still do reviews, and now, when I find an aspect of craft I'm bad at, the blog is the perfect place to hone that skill. The greatest part is people with more experience often stop by and tell me how I'm doing. For example, when I was working plotting, I would post plot points to well known books and let people tell me how accurate my analysis was. A good reason to start a blog. What a great answer! I think writing reviews as much as I do has definitely improved my writing skills. Keep up the good work! Reading can give you so much insight on your own writing! I've been trying to push myself to go back to some of the classics and pick apart what they do well. I'm currently reading 'The Crucible', and Miller does a fantastic job creating interpersonal tension, which I'm trying to improve in my next WiP.